Rather than posting arbitrary grades for every player, I wanted to do a scouting report for each of the Pistons' rotation players. My Twitter feed turns into a list of the players' strengths and weaknesses during games, so it's worth putting it all into perspective (this will not be unlike the DraftExpress scouting videos). Up first, Brandon Jennings. Though I haven't run the regressions--because who would after a season like the Pistons just had--Jennings' performance was strongly correlated with the game's result, even moreso than Josh Smith's numbers, who was simply bad across all games. 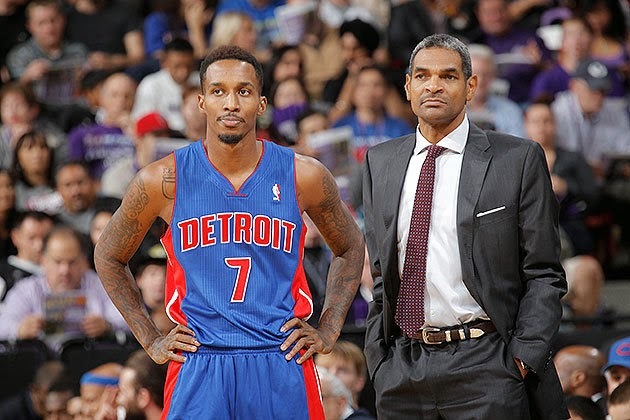 Like most members of the Pistons, Jennings had his worst statistical season in several years. Unlike most of his teammates, Jennings still put up a league-average statistical season (15.67 PER) and showed dramatic improvement in a few aspects of his game. Distribution. Jennings has always been a talented passer and exceptional at holding onto the ball. In his career, he's never had a TO% higher than 10.2 (earned this year) and has had three of five seasons with a sub-10 TO%. 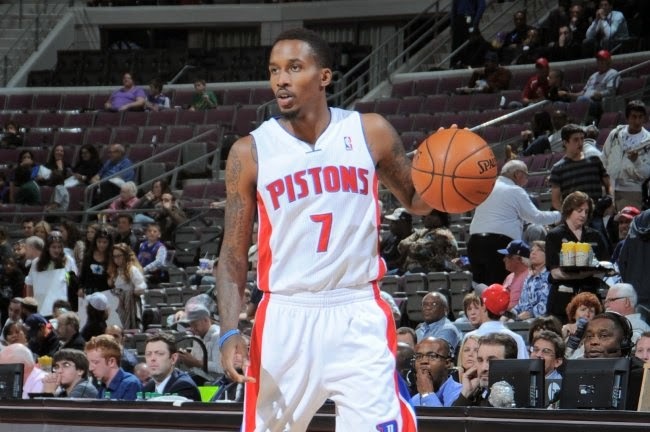 When he was first traded to Detroit, Jennings made some disparaging comments toward his Milwaukee teammates about the talent surrounding him and how he'd blossom with the Pistons. Though it didn't show in the win column, that boast came true. Jennings finished the season 7th in assists per game (7.6), and of those players who finished above him, only one player (Chis Paul, 2.3) had less turnovers than his 2.7 per game. He finished 15th overall in A/TO with several low-usage guards (Shelvin Mack, Pablo Prigioni) finishing above him. What's more impressive about his ball security is the amount that Jennings handles the ball. Back when I was still impressed with John Loyer (literally, one game made me write this, which shows you how much I despised Mo Cheeks), I noted that Jennings ranked fourth in time of possession per game and fifth in frontcourt touches. He finished the season 7th and 10th in those categories, respectively. His ability to generate points without turning the ball over is a major asset that Stan Van Gundy should be able to take advantage of, especially if he can tone down Jennings' penchant for havoc. Scoring. It was clear early in Jennings' career that he was capable of monstrous scoring outputs. Jennings scored over 25 points in 11 games this season, an incredible output for a player with the passing skills that he possesses. It was perhaps even more impressive given that the Pistons' frontcourt averaged 37.9 shots per game between them (43.6% of the team's total shots came between the trio Monroe, Drummond, and Smith). Consistency was always a problem for Jennings, about which more later, but he's a player who has the ability to light up the scoreboard from all areas of the court. His three point shooting, though spotty, had multiple flashes of brilliance with multiple games going 5-9 and several 5-8 and 4-8 outings. He also posted a 6-11 game in which he put up 35 points in a win against Denver. While this can sometimes work against Jennings, it nevertheless makes him a joy to watch. Like Rajon Rondo, Jennings seems to have an endless bag of tricks. Unlike Rondo, he's not concerned with his assist stats and won't pass up easier buckets for the sake of flashy passes. On the fast break and in traffic, Jennings keeps the ball on a string and makes behind the back, no look, and off-the-backboard passes (accurately, no less) that few players will try. It makes him difficult to guard and forces defenders into positions that they're unable to recover from. Pick and roll. Despite having a terrifying pick and roll partner in Andre Drummond, Jennings proved this season that he has no idea how to execute the league's most devastating offensive play. According to Synergy, Jennings ranked 100th in points per pick and roll as the ball handler, averaging less than a point per play (.77 ppp). Some of this has to do with the fact that he's a terrible finisher at the rim, but he also turned the ball over on 15% of these plays. Jennings' real issue here is a lack of patience. He doesn't have the rhythm of the pick and roll and fails to allow the roll man to get into a good position in the lane. By doing this, he also doesn't put the defense in the kind of bind that will force them to help off of corner shooters. 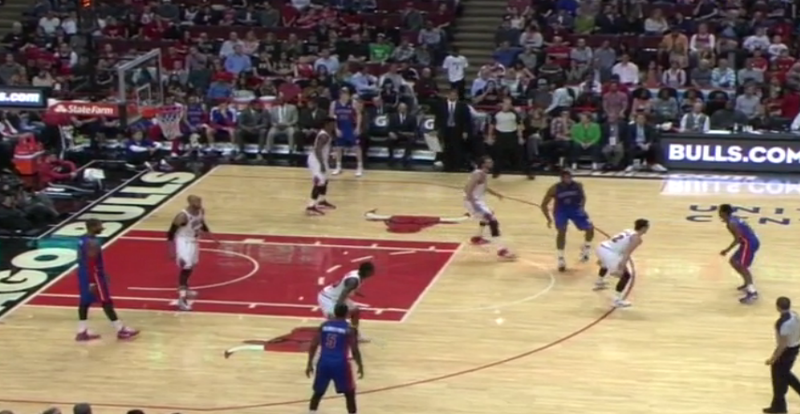 Wait a moment longer and Drummond is running into the lane with Hinrich on his hip. Instead, Jennings takes the worst possible shot rather than surveying the situation and seeing how to attack the defense. Finishing. Need I say more? Consistency. Tied to his previous two weaknesses, Jennings had more ups and downs than anyone on the roster this season. Those 11 games where he scored over 25 points? He also had 21 games where he scored less than 10, including a few games where he scored zero or two points. He scored these on not insignificant amounts of shots either. 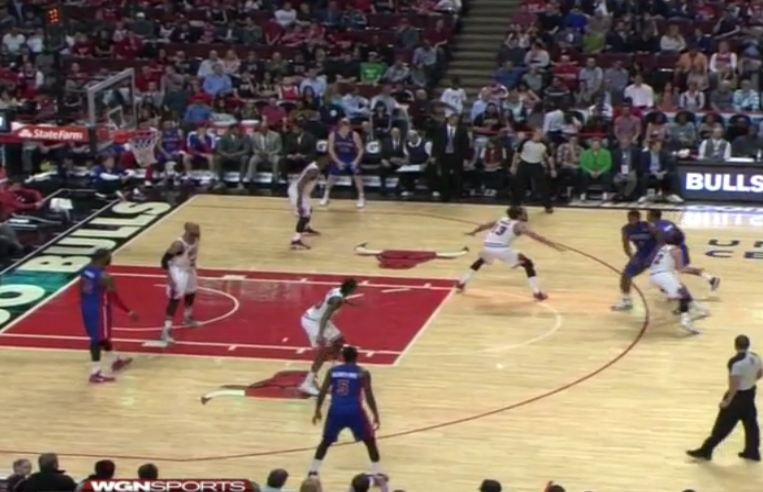 The pick and roll issues hinder his consistency. With a better understanding for the league's most unguardable play, Jennings should be able to both increase his assist count from the previous year and score more points as defenders overreact to the crashing bigs. But consistency has plagued Jennings thoughout his career. If SVG, a notorious drill sergeant, can't cure his ills, it's likely no one will be able to. Defense. James Harden-ian (?) levels of incompetence here. 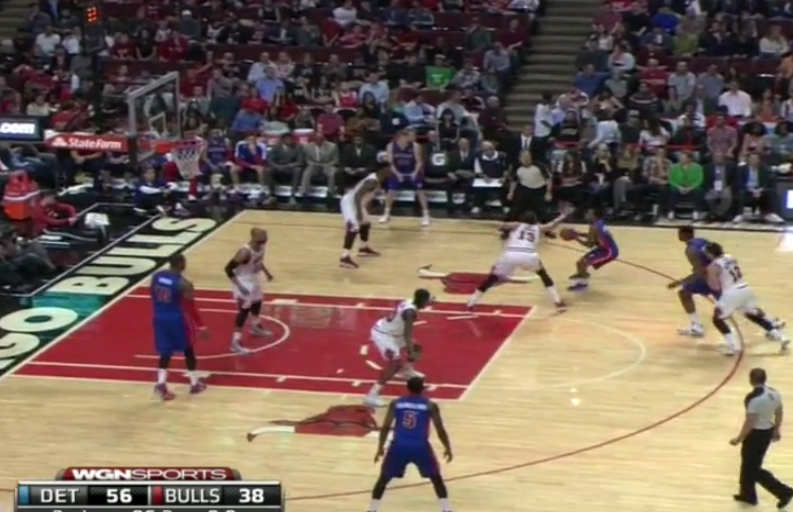 Jennings' disinterest in playing defense is only trumped by his inability to actually play defense. He gambles for steals, never helps, doesn't rotate, and is frequently taken off the dribble. Given his lateral quickness, you'd expect him to be a better defender, but he has a poor defensive stance in which he's often hunched over. This is likely due to his tendency to go for steals, but often results in an ability to turn his hips and keep with the ball handler. 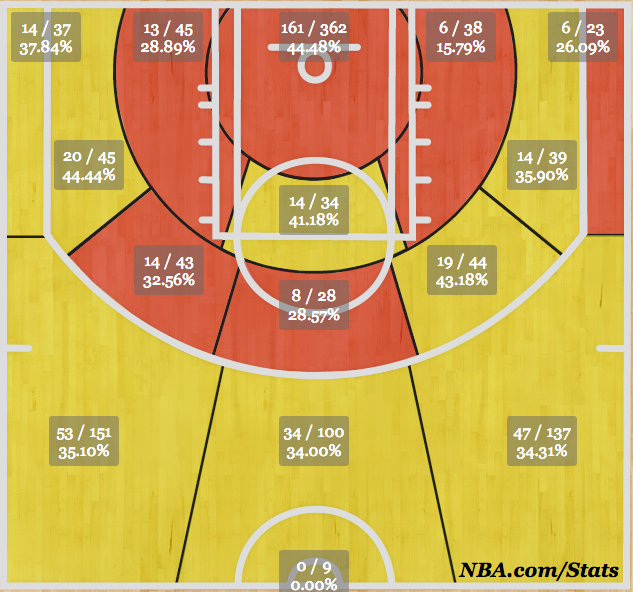 Jennings is still only 24 years old and entering his sixth season in the league. Lesser talents have put it all together later in their careers, and Jennings still has the potential to become a top-flight point guard. SVG stands as a best-case scenario for the Pistons' young, inconsistent roster: someone who will drill consistency and composure into their heads, Jennings not least of all. With a reasonable, short contract, the Pistons could deal Jennings, but given his ability to distribute and occasionally stretch the floor (he's a career 39% 3-point shooter), he could become a valuable role player in SVG's offense. Regardless simply having a better coach and more coherent offensive/defensive schemes should see Jennings make marked improvements next season.